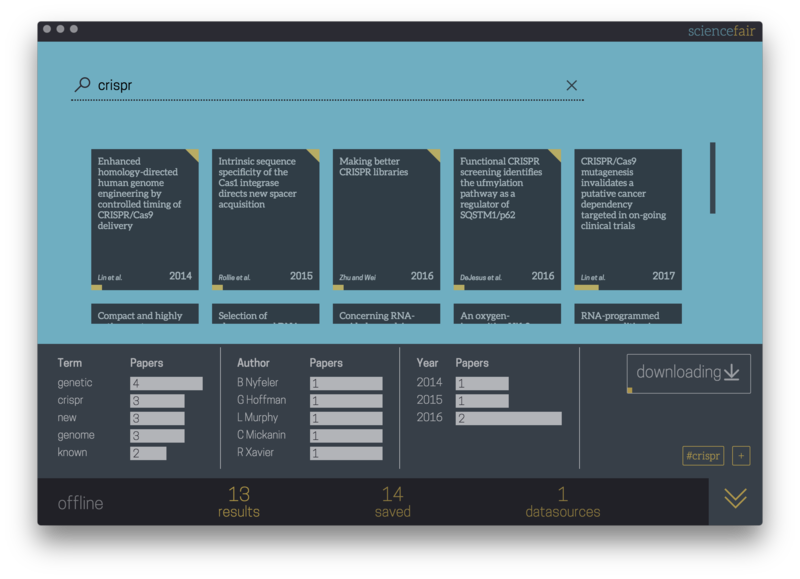 The open source p2p desktop science library that puts users in control. We've released :balloon: v1.0 :balloon:! But we're just getting started. Check out the roadmap to see where we're headed. How we access, read and reuse scientific literature is largely controlled by a few vast publishing organisations. Many wonderful innovations are being explored outside those organisations, but they are rarely integrated into the platforms where people actually access science. We have a vision of a different, better, future for science. A future that's more fair, inclusive and open. A future where people can explore and innovate and where users control and customise their experience. 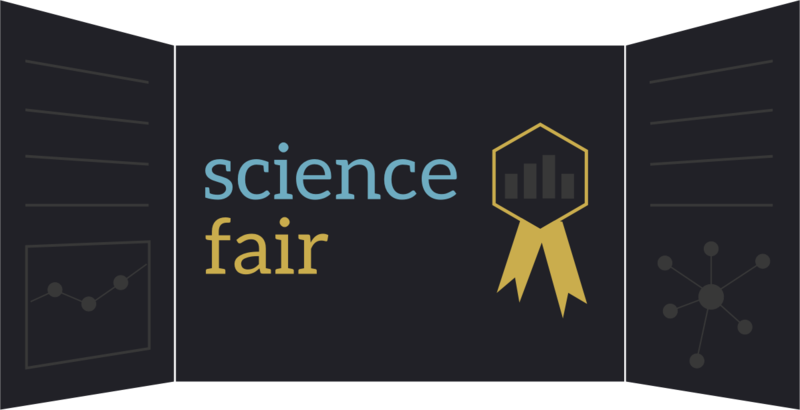 ScienceFair aims to help pave the road to that future. The main thing that sets it apart? Freedom from centralised control. You can download installers or bundled apps for Windows, Mac and Linux from the releases page. Please note that ScienceFair is currently pre-release, so there will be bugs - we're working hard to polish it to v1 release standard. If you'd like to report bugs in the issue tracker, that would be super helpful. 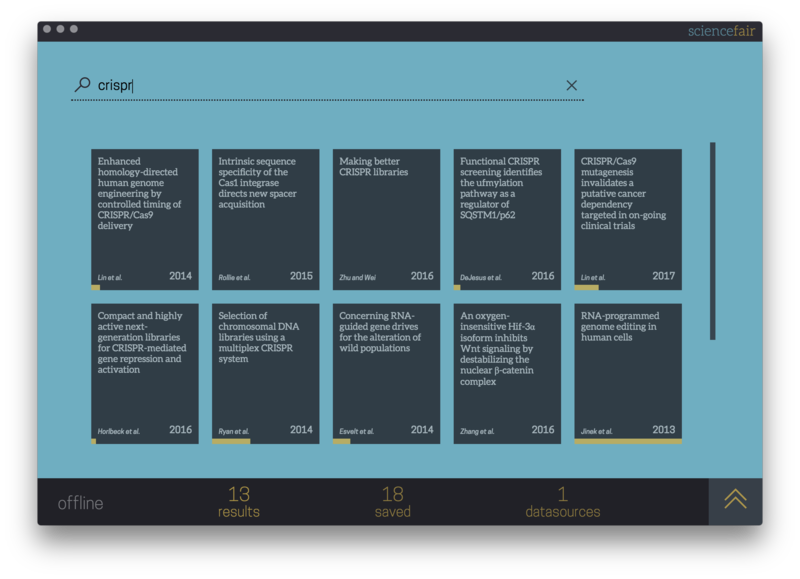 We use the beautiful Lens reader to render JATS XML to a reading experience optimised for scientific papers. Instant search of your local collection and remote datasources, only downloading the data requested. 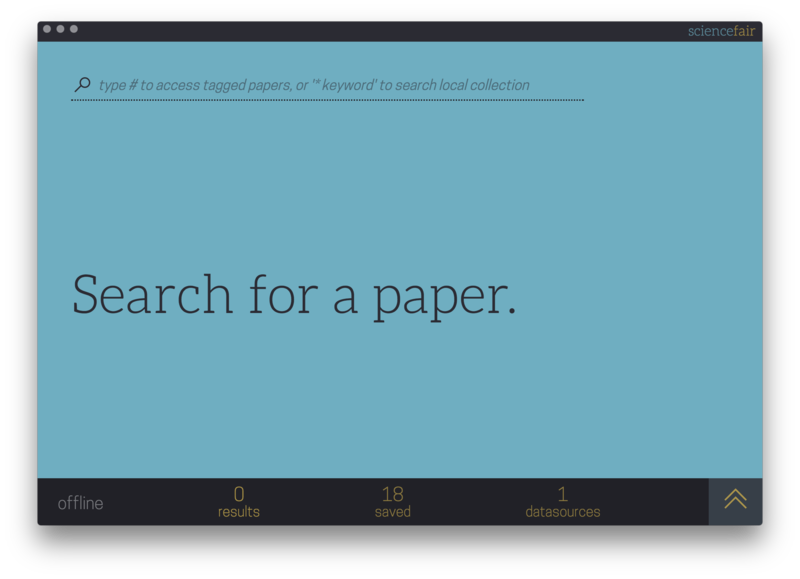 A ScienceFair datasource can be a journal, a curated community collection, a personal reading list... anything you like. 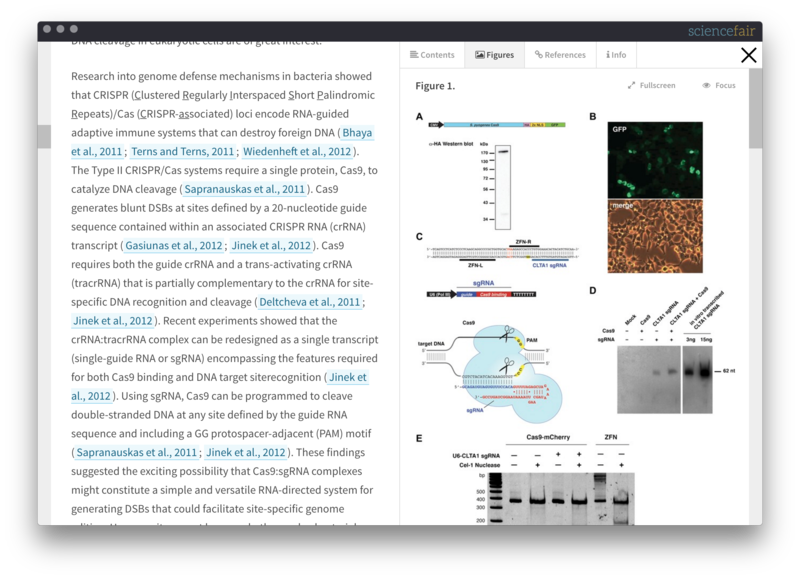 v1.0 comes with the eLife journal by default, and more will follow very soon. And importantly, datasources you create are private unless you decide to share them, and nobody can ever take a datasource offline. Basic bibliometrics are built-in in v1.0. Full analysis and data-mining tools, alt-metrics and enriched annotation will be coming soon. This project uses node v7, ideally the latest version. It also uses the two-package.json structure (what?? ).